Sourced and packaged in America, our Honey Sampler features four jars of Eastern Shore Honey from our own farm and other beekeeper friends on the east coast. 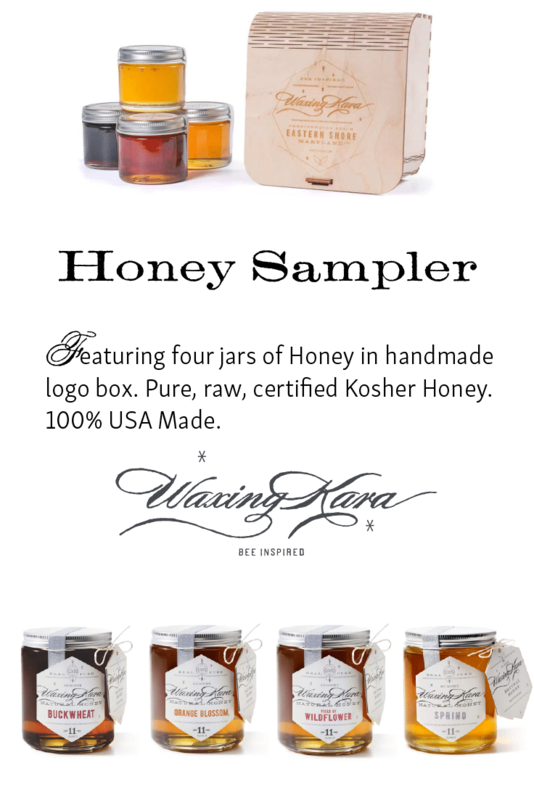 A perfect gift, our honey is pure, raw, and certified Kosher. Earn 50 Points when you purchase this item! What’s your favorite honey? 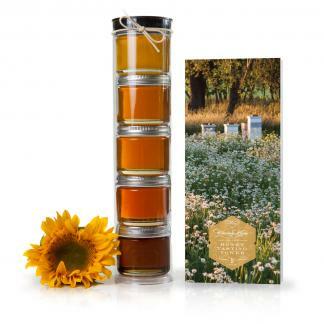 This Honey Sampler is a beautiful way to decide! Our Honey Sampler features a collection of pure, raw honey from our own farm and beekeepers from across America. Each jar is pure, raw, and certified Kosher. Perfect for any celebration including Rosh Hashanah. Pure, raw honey is perfect for cooking, baking, and using fresh in tea and on fruit. Each honey offers a unique flavor.We recommend using lighter honey in drinks and fresh foods, and dark honey in cooking and baking. Feel free to experiment and tell us what you discover! We’ve packed this Honey Sampler in a hand made beautifully designed box-it’s a unique presentation that makes for a fantastic gift! Perfect for hostesses, chef-friends, and honey connoisseurs. Reuse the handmade box for jewelry, trinkets, love notes and more. Beyond simple honey party favors, our Honey Sampler makes perfect gifts for mother’s day or father’s day. Share a little bee love with this special gift set. Estate produced on Chesterhaven Beach Farm, this honey is deliciously different than anything you would buy in a store. This amazing honey is mildly sweet and bursting with floral notes. You’ll experience hints of lavender, spring fruits, black locust, and wildflowers. Our rich and complex Wildflower Honey is created from the nectar of wildflowers on the Eastern shore. Wildflower honey is best described as polyfloral because the bees travel to many types of flowers collecting different types of nectar to create it. This honey is mild, with a richly buttery texture. Florida Orange Blossom Honey is medium-bodied, floral, round and warm with notes of jasmine and citrus. Perfect for drizzling over desserts and into tea, this honey also makes a fantastic glaze on chicken and fish. This season, our Buckwheat Honey is from New York, though at times we acquire it from Pennsylvania. The small white blossoms on the buckwheat plant produce a hearty, strong honey very similar to molasses. I’ve been meaning to tell you how much I really like the packaging design of your products (as well as the products themselves). Your logo, the colors, the organic earthiness, the inspiring quotes, etc. You’ve done a great job and I think it’s going to be a huge success! This means so much, thanks!